Our chefs are local, creative, resourceful types who have used these attributes to design classes to inspire and to demonstrate how to create simple, tasty and great-looking dishes. We use classic and modern methods of preparing and cooking to present the wonderful produce on offer in our region and in New Zealand. Once upon a lifetime ago, I was a winemaker before becoming a mother and a wife. When I was in my twenties I used to pay a flatmate to cook when it was my night! ​I enjoy meeting people and preparing and sharing a meal and I am looking forward to being your Host and assistant kitchen hand. I came to a career in cooking after working in IT for a number of years. In 1995, after deciding there was more to life than a screen, I enrolled at Wellington Polytech (now Massey University) completing a Certificate in Catering, Hospitality and Tourism. Following on, I worked in Wellington for a couple of years alongside some very talented and respected Chefs. In 2000 my husband Richard and I moved to Martinborough and since then I have worked in cafes and restaurants in the area, when not attending to my Alpacas. 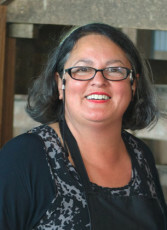 Corrie has been a chef for 35 years, starting her working life training for her City and Guilds, she then owned restaurants in Wellington, Crete and Melbourne. 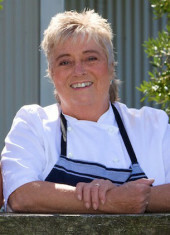 Returning to the Wairarapa in the early '90's, she married Pete Bargh and together with Peter's brothers Rob and Kev, they have an organic dairy farm and grow figs in their Orchard at Te Pare Farm, Kahutara. 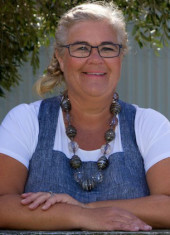 Corrie and Pete also own a holiday home in Tora and along with her skills in cooking seafood, Corrie is excited to have the opportunity to share her passion for cheese making with you.